Imagine you’re an insect cruising through the air. Suddenly, you realize you’re heading straight for a spider web. You’re doomed. But wait – you can still escape by slipping through one of the gaps. Spider webs are, after all, more gaps than web. You aim between the sticky threads – it’s going to be a close call, but you’re going to make it. Then, as you pass through, the threads snap towards you … and you’re a spider’s dinner! It sounds impossible that the threads of a spider web could actively reach out for prey, yet recent studies show that it is not only possible, but may be yet another ingenious spider strategy for capturing insects on the fly. How do webs do this? Static electricity. It turns out spider webs are attracted to the static charge on flying insects. Flying insects build up a static charge from the friction of passing through the air, the same way a person can pick up a charge by shuffling in fuzzy socks along a carpet. During calm weather, when most insects are out and about, air contains more positive ions than negative ions. As an insect flies, it gains a slight positive charge. Bees are known to pick up a charge of as much as 200 volts! 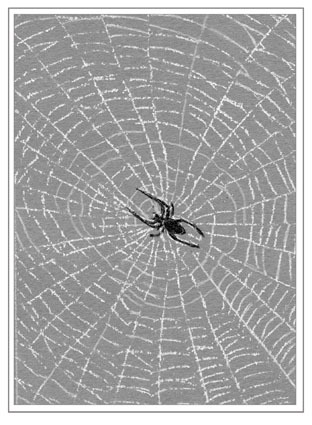 No one knows for sure, but spider webs probably don’t have much of a charge under normal conditions. So can an electrically neutral web be attracted to a positively charged insect? It turns out that it can. The attraction happens through something called static induction, which you’ve already experienced if you’ve ever rubbed a balloon on your head and stuck it to a wall. The balloon gains a static charge from being rubbed, and then induces the opposite charge in the wall. With nowhere to go, those charges build up, allowing the electrostatic attraction between the balloon and the wall. Static induction works best with materials that are poor conductors, like rubber or silk. The same principle is at work between a spider web and an insect. As an insect carrying a positive charge nears the threads of a spider web, that positive charge attracts electrons in the spider silk, creating a temporary negative charge. That negative charge can then be attracted to the positively charged insect, causing the spider threads to snap out and stick to the spider’s dinner. Orb webs are well-set-up to use electrostatic charges. The silk is coated in a glue that tends to hold water droplets, and those droplets can build up a lot of static charge. At the same time, the silk in these webs is especially light and stretchy: perfect for reacting to a passing insect. Scientists have observed that web threads can move by as much as two millimeters, far enough to match the body length of a small insect. The average spacing of the spiral threads in a web is two millimeters, meaning the threads can bend far enough to close the gaps. Pollen can also be positively charged, and some spiders catch it in electrostatically charged webs. Orb web spiders are especially fond of pollen, and this vegan fare can make up as much as a quarter of their diet. Rachel Sargent is an editor for a pharmacology journal, as well as a freelance nature writer and illustrator. The illustration for this column was drawn by Adelaide Tyrol. The Outside Story is assigned and edited by Northern Woodlands magazine and sponsored by the Wellborn Ecology Fund of New Hampshire Charitable Foundation: wellborn@nhcf.org.